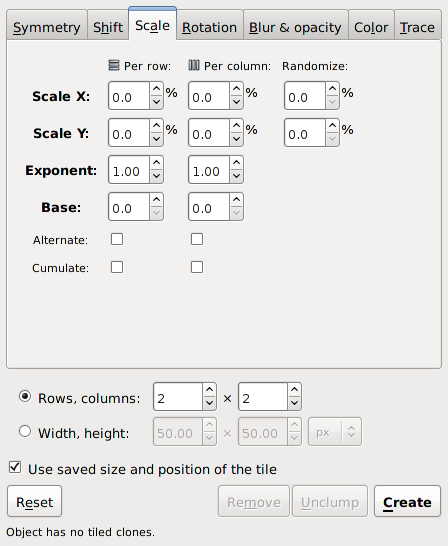 Scale X, Scale Y: Scales each tile in terms of percentage. A random factor can be added. Exponent: Scale each tile with an exponential factor. The nominal scaling S becomes Sexponent. Base: Used to create a logarithmic spiral along with Rotation. The nominal scaling S becomes baseS-1 unless base is one in which case scaling remains unchanged. Use a value less than 1 for a converging spiral and a value greater than 1 for a diverging spiral. A true logarithmic spiral would use a base of e = 2.718 (or 1/e = 0.368). See the Tile Tricks section for examples. Alternate: Alternate scaling up and scaling down tiles. The Scale tab of the Tile Clones dialog. A P1 symmetry tiling with a negative scaling. There is an −15% x scaling for each column and a −15% y scaling for each row. 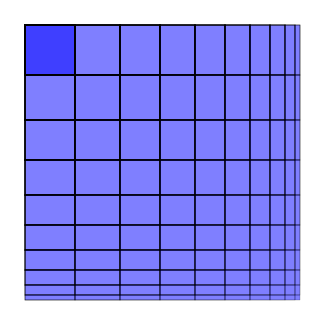 The scaling is a percentage of the base tile bounding box. The spacing between the center of adjacent tiles remains fixed. A P1 symmetry tiling with a cumulative negative scaling. 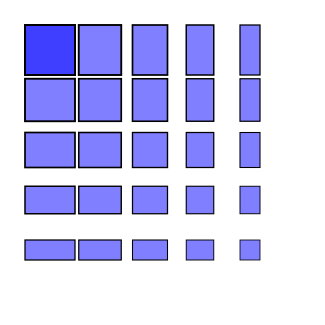 There is a −10% x scaling for each column and a −10% y scaling for each row. There is also a −5% x shift for each column and a −5% y shift for each row. The Cumulate box is checked for both x and y. A general rule is that to keep scaled tiles just touching, specify a cumulative shift that is half of the scaling (in percent).